Savoring spring-like temperatures: How long will this warm weather last? Posted on Wed, Mar 7, 2012 : 1:42 p.m.
From left: 2-year-old Ann Arbor residents Reese Schoebel, Madeline Mignery and Addison Gregg enjoy a bagel outside on North University in Ann Arbor during the unseasonably warm but windy weather. Spring is visiting the Ann Arbor area today with highs in the mid-60s, inspiring local businesses and residents to think about the outdoors. Dairy Queen employees are prepping for a busy afternoon and evening. Manager Elizabeth Lasley said the business may have opened its doors for the season March 1, but workers expect this afternoon to really kick the season off as the first big rush of the year. Employees at Ace Barnes Hardware on Washtenaw Avenue are replacing snow shovels with rakes and featuring soil over salt. Area residents are getting out and walking around as the skies clear and the temperature rises, despite it being a little windy. University of Michigan School of Art and Design sophomore Elise Beckman plays guitar and sings under a tree on campus during the warm but windy weather. 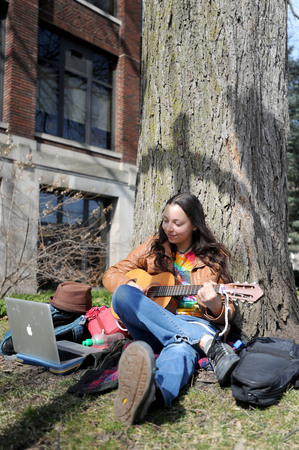 University of Michigan sophomore Elise Beckman sat under a tree on campus and played guitar in the sunshine. She said her plans involve more relaxation with her guitar in the warmer weather before it gets cold again. After a session of ballet, Ann Arbor resident Anna Mignery and her 2-year-old daughter Madeline enjoyed the breeze outside while eating bagels on North University Avenue. She said their afternoon plans will definitely revolve around outside activities. The record high for March 7 in the Ann Arbor area was set in 2000 at 75 degrees, University of Michigan weather observer Dennis Kahlbaum said, but don’t get too used to it. A cold front is on its way from the Southwest and will cause temperatures to drop down to lows in the 30s by Friday. A high temperature of 55 is expected Thursday. Temperatures will cool to mid-30s by Friday, but swing back to the mid-50s for Saturday. Fri, Mar 9, 2012 : 6:34 a.m. Hold on to your hats kiddies Winter isn't over yet.maybe the extremely bitter stuff but it still will be cold and blustery probably at leat until the end of March. Fri, Mar 9, 2012 : 5:27 a.m.
What was strange the night before: it was after 1 AM before the temp dropped below 60. Not an expert but the difference this past four months seems to be that there are fewer cold fronts and NO lasting cold air masses hovering around here. I bike commute a lot - so I'm very aware of daily weather. Compared to winter of 2010-2011, this one is &quot;heaven.&quot; Almost contradictory but so far, March seems typical with winds and fluctuating temperatures. But like treetowncartel says: there's been little difference between what we &quot;started with&quot; last November and now. This has either been the longest November or March on record. We never saw the months in between this winter. Thu, Mar 8, 2012 : 7:01 p.m. I KNOW...crazy warm...but welcome winter. Makes my Malamute very unhappy, and my horse and I have been loving it! Fri, Mar 9, 2012 : 5:19 a.m.